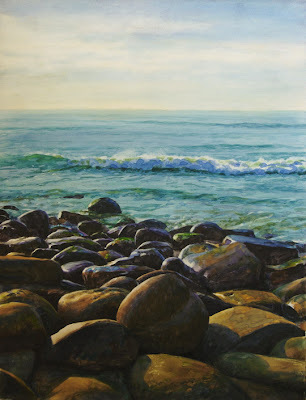 Watercolor on archival paper, 19.5" x 15"
Since I seem to be on a theme of rocks and water, this is a recent work painted for entry in a juried exhibit. The jury's still out... or maybe they've decided and they just forgot to phone...maybe I should call and remind them. Gorgeous! I love your work. excellent stuff. that "reflections" painting is dazzling. Beautiful work. I am also a lifelong resident of the NW and find inspiration in every direction. We live in a magical place. Lovely colour and light here Don. Great job! Amazing. The light and color of the water is dead on. Thanks for coming by, Michelle. We do indeed live in a beautiful part of the country. Gordon, glad you stopped in, and thanks! Thanks, Frank, I do appreciate hearing from you. As for juries.... maybe they're finishing up their taxes! very beautiful! i want to jump right in! Sensational, Don! Again, peaceful yet riveting. You do watercolour so well Don; I have no doubt it will get into the show - this is superb. My little love seat pillows arrived yesterday. I am so thrilled to have another of your works in my collection. As with the other two, this one has a cosy warmth that is such a pleasure to view. Thanks, Martha. Yes, I've known Alan Magee's work for a long time. I saw a show of his at the Forum Gallery in LA a couple years ago--mostly still-life's with paintbrushes and stones. It was terrific. Hi Suzanne, thanks for coming by and welcome back to blogland. Hope you had a great hiatus. I'll be checking out your new posts. Hi Silvina, I sure appreciate your thoughts--thanks. Triecia, glad to hear the painting arrived safely. Thanks so much, I'm very honored. Really, Don, it is hard for me to believe you can do a "daily" painting at this level of finish. Thanks, Lisa/Bill. If you read my April 8th post you'll see I didn't intend for people to think these most recent postings were "daily" productions. I should make that clearer with each post. These last 2 pieces are just beautiful Don- such a mastery in both mediums!